The S-4001 ISBH machine is designed primarily for decorative sewing of buttonholes using special threads such as silk thread. The chainstitch imitation sleeve buttonhole machine is programmable to sew automatically up to 8 imitation buttonholes at specific distances between each buttonhole. The machine clamps can be set to sew imitation buttonholes at an angle of 0 to 20 degree from a sleeve cuff. The chainstitch imitation sleeve buttonhole machine is offered with large touch screen display that uses easily understood symbols and graphics to simplify the adjustments. The optional laser lights mark the position of the sleeve at the beginning of sewing cycle. The high sewing speed up to 3800 spm and the short sewing cycle increase productivity and the single pedal electronic start reduces operator fatigue. The electronic start and stop motion extends machine life and improves machine reliability by eliminating the stop motion and clutch mechanisms. DC Drive Motor is fully enclosed within the head casting, eliminating the need for an under the table mounted clutch motor, pulley, belt and brake. This reduces required maintenance and eliminates oil and dust around the working area. Machine is equipped with a touch screen display using easily understood symbols and graphics . The S-4000 ISBH produces a buttonhole which has a similar appearance to a normal buttonhole but is purely decorative and non-functional. This type of buttonhole is not cut and is used on the sleeves of men’s and ladies’ jackets, suits and sports coats. Since this buttonhole is not cut, and is done on a fast chainstitch machine, sewing at speeds up to 3,800 spm, the operator is able to sew 2 – 3 times more jacket/coat sleeves, than with a conventional buttonhole machine. Only one square bar is sewn while at the other end the small stitch gives the appearance of a rounded end. On the finished garment the button is sewn over the square bar. The size of the buttonhole is from 15,8 mm to 25 mm (5/8” to 1”). To see the difference between the regular and ISBH buttonhole please see the drawings below. Chainstitch buttonholing provides increased productivity with no bobbin change. The elasticity of the chainstitch also provides the flexibility needed for many fabrics such as knitwear. Pneumatic cutting reduces the number of adjustments and increases the consistency and reliability of the cut. Pneumatic clamping reacts to different thicknesses and types of fabric. Pneumatic thread trimming gives consistent and reliable trimming at the end of each sewing cycle. The S-4000 series is equipped with the drip oil wick lubrication system and oil level monitor. This system prolongs the machine life and reliability. 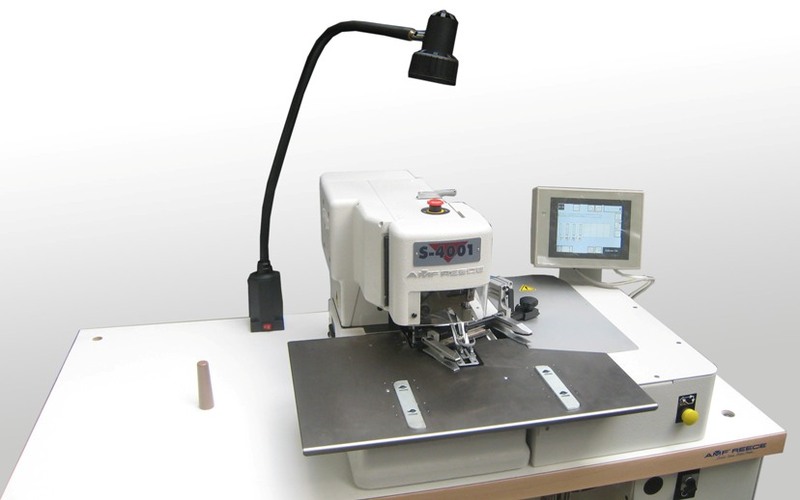 The S-4000 series has electronically adjustable sewing speed up to 3,800 spm and are the fastest chainstitch buttonhole and special application machines available. Due to the DC Drive Motor the machine is 20% faster than other models. The noise level is also significantly lower on the S-4000.